1. I start by brushing trough my eyebrows. 2. 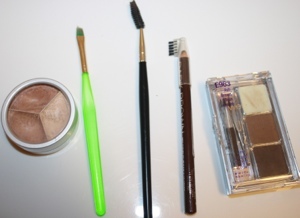 I then fill in my spares areas of my brow, with light strokes using a medium brown powder. I extend the tale of my brow with a dark brown eyebrow pencil. 3. After that I outline my eyebrows with a thick concealer that’s two shades lighter than my skin tone, this will define my eyebrows and make them look more “polished”. I do this step using a synthetic angled brush. 4. Finally, I blend out the concealer using my fingers as well as combing trough my eyebrows one more time! 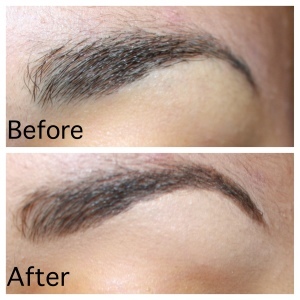 Here’s a before and after picture of my eyebrow. And you can see that my brow looks a lot better when it’s filled in,even though I have naturally thick brows. Products I used: Viva La Diva 3 in 1 Foundation, eyebrow brush, H&M’s eyebrow pencil in Dark Brown, Wet n Wild’s Eyebrow kit. I have never ever bothered filling my brows in as they always look too false. I’m going to try again I think. 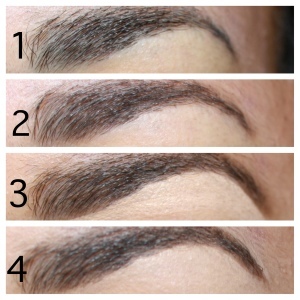 I love and can respect a good eyebrow, great post! Thank you! Yes you should get that colour and your brows will look gorgeous 😉 thanks for commenting!